It is our privilege to provide transportation to those in our community who would like to attend church but are unable to due to lack of transportation. Our vehicles are clean, safe and dependable. Our drivers are courteous, careful and experienced. We provide door to door service. Our drivers pickup from 8 - 8:30 am on Sunday mornings. 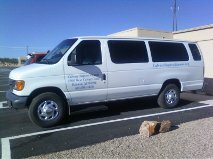 Transportation for our other services is also available by special request.